The plans, submitted to Birmingham City Council by the forward-thinking property investment and development business Calthorpe Estates, update the 2018 approval for the new Building 4 Medical Hub on the former BBC Pebble Mill studios site, now set to offer leading cancer treatment and an oral theatre suite. The application sets out a revised vision for a 10,600 sq m (114,098 sq ft) building, over four storeys, with a single storey basement, along with 167 parking spaces. 17 electric charging points and 34 cycle spaces are also included within the plans. It is anticipated that the medical facility building will be rated as ‘Very Good’ in the BREEAM rankings, putting it in the top 25% of new non-domestic buildings in the UK. Calthorpe Estates previously received outline planning approval for a 9,000 sq m (96,875 sq ft) mixed medical facility building on the site in June 2018. Ralph Minott, Development Director for Calthorpe Estates, explains: “We have had strong interest in Building 4. Now we have more clarity on the pioneering medical treatments to be provided within the Building 4 facility and accordingly the specialised equipment constraints, this application seeks the building’s increase in terms of square footage. However, this will be achieved through a smaller collective mass, reducing from the up to eight storeys approved at outline stage to four, and from a two storey basement to just one. Located off the Bristol Road on Mill Pool Way, Pebble Mill is part of Edgbaston Medical Quarter, a world-class medical and healthcare destination which brings together healthcare, academia and industry to support growth within healthcare and life sciences. It is located within walking distance of the Queen Elizabeth Hospital and University of Birmingham, and is only a mile from the City Centre. Pebble Mill is already home to the Birmingham Dental Hospital & School of Dentistry and a 62-bedroom Bupa care home, which sit alongside a tranquillity garden. These will be joined in 2019 by a new 19,000 sq m (204,514 sq ft) Circle Health private hospital and rehabilitation centre, due to open in the Autumn. 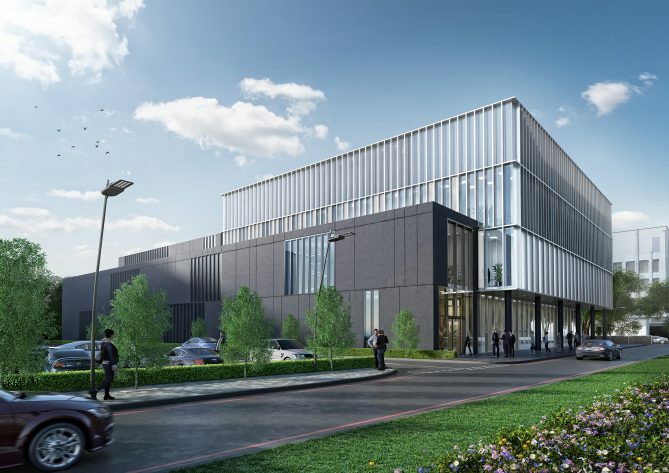 When complete, Pebble Mill will offer over 46,450 sq m (500,000 sq ft) of world-class medical and healthcare facilities, in addition to new food & beverage space and community access sporting amenities.